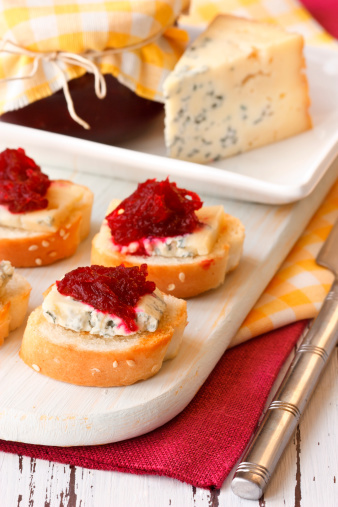 You can't beat this healthier beet and goat cheese crostini! Roast your own beats, and swap the white bread for a whole-grain baguette, to make transform this mouth-watering appetizer into a healthier choice! Cut off beat leaves and thoroughly clean beats. Individually wrap beats in tin foil, leaving a little breathing room. Place foiled beats on a baking sheet in the oven and roast for approximately 50 minutes, or until cooked through. Combine goat cheese, olive oil, balsamic vinegar, arugula and walnuts in a medium bowl and gently toss. Cut the baguette in half lengthwise and then into smaller finger food pieces. Allow beets to cool to room temperature, then dice. Add beets to goat cheese mixture and toss entire mixture again. Spoon beet and goat cheese mixture onto the baguette pieces. Top with a little fresh cracked pepper if desired.